The leather notebook Everywhere large is presented for all those whose love for travelling is compounded by their love for writing down their recordings of what why see and experience – a writing that they can use to relive those moments is beyond compare. 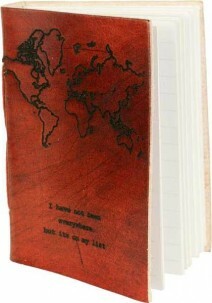 Such is the love for travel that the leather cover of this small notebook has an imprint of the world map, like an etching, with words that any traveller would love to say. Be the first to review “Leather Notebook Everywhere Large” Click here to cancel reply.